Our Fall 2018 conference sought to launch a conversation on how our political systems and processes have been hacked in ways our founders could never have managed, asking the question: what can we do now to ensure a just and equitable future? In true BCNM fashion, we tackled this issue from a true interdisciplinary perspective. Legal experts, social theorists, artists, and technologists offered their insights into the fundamental shifts in the political landscape that new technologies have introduced. Below are some of the highlights of the day. Larry Nordern launched the panel with a presentation on how we can secure our voting and election infrastructure. Ultimately, he noted that our greatest issue is simply the sheer complexity of voting in the US. Each district runs their voting differently, whether by paper, machine, or mail. The machines themselves are often from a variety of companies as well. Since the decisions are made on a local level with very little budget, there is little will or ability to provide robust security measures. Meanwhile, vendors of various items such as the websites, poll books, voting machines require no background checks and are ripe for hacking. Ball point pens ultimately have more regulations than voting infrastructure. Larry offered several ways we might improve our infrastructure: (1) offer paper back ups for when machines fail; (2) regulate vendors of voting equipment and services; (3) provide money to local governments and require a minimum level of security. Ruth Greenwood followed with insights into partisan gerrymandering. One of the key takeaways she offered was that strange looking districts are not necessarily bad. Often, these are important in order to ensure adequate representation. The Campaign Legal Center, along with partners such as Code for America, therefore built a tool that measures wasted votes from the technique of packing and cracking. This they term the “efficiency gap,” which they argue is a far better measure of gerrymandering. While Ruth and her team have been effectively litigating several instances of gerrymandering through this data across the United States, she noted that in order to effect real change, you have to change the process of redistricting, rather than the outcomes. Ruth held up as an example an area of LA that had community discussions around the districting process to ensure equity and inclusion. Ingrid Burrington concluded the formal presentations in the first panel with a discussion on how private actors are patching the failures of public works, to detrimental effect. Facebook was a key example in its ability to connect, but its lack of regulation by government. Given that its overall concerns lie with its bottom line, rather than its service to the public, it has been ripe for capture. In the panel, moderated by Sara Dean, discussion focused on the difficulties of accessing adequate information in order to take cases to court against gross campaign violations. It became clear from panelists that the advent of new, cheaper tools and technologies have had an immense impact on lawyers’ ability to quickly respond to transgressions. A stunning reminder from panelists was that the system as it currently functions was designed specifically in order to deny people. In that sense, this isn’t a question about how our new technologies can be used for ill to disenfranchise others. It’s a question about how we want to design our democracy to function. Hot on the heels of the legal issues around our political system, Nate Persily offered a fascinating talk on how technology specifically has changed democracy in our culture. As Nate noted: fake news is as old as news itself, and hate speech as old as speech, so what makes this current moment unique? Nate recognized that much of what has changed is the speed of activity and the peer-to-peer nature. Given that elections are date specific, our institutions are not well prepared to deal with virality, nor are they sophisticated enough to tackle search engine optimization that privileges such trends. In addition, radical views are able to be amplified and anonymized on the internet, giving them a larger platform -- and often giving non-nationals an opportunity to impact the domestic conversation. Nate provided some options for tackling these issues: deleting bad content and actors, demoting them in search engines, disclosing their identities, delaying their virality, diluting their messaging with other information, deterring the actions through regulations, and providing basic digital literacy education to all. Maciej Ceglowski, a technologist who founded Tech for Solidarity and traveled across the country meeting candidates before the 2016 election, shared his surprise at how disorganized many campaigns were, particularly on security issues. Many candidates were operating out of a single bedroom and didn’t have the resources to worry about security. Ultimately, Maciej discovered through his work with Tech for Solidarity that many of the issues facing our political system cannot be simply “hacked” to be solved. Flat wages, our state of emergency, our decaying institutions need real investments that money and clever fixes won’t solve. Gireeja Ranade was the co-author of a paper on the impact of fake news. Their study determined that some organizations were systematically spreading misinformation -- their traffic was not organically routed through social media, but rather through emails and direct URLs. She noted that news organizations barely have a chance to research their stories as impressions spike on these topics immediately, leaving traditional media chasing the lead. Moderator Dean Ed Wasserman brought up a fascinating point that it hardly seemed that technological tools themselves were undermining democracy, as they could equally, or even more so, undermine authoritarianism. The panelists noted that the issue is around fundamental political decision making, which should be governed by process not the court of public opinion, and certainly not by misleading, polarizing content. 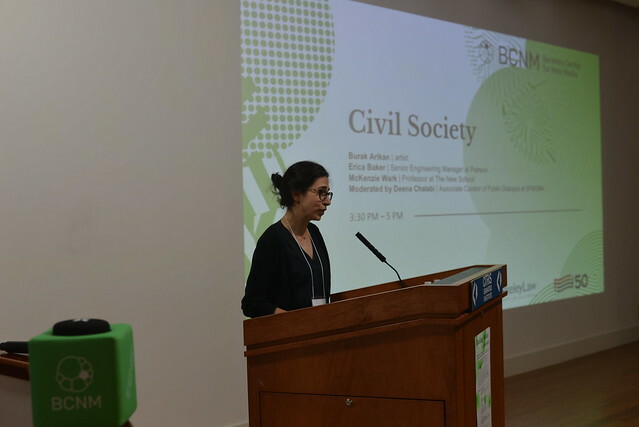 McKenzie Wark, professor at The New School, offered an historical and theoretical grounding for the development of civil society, arguing that society is in fact decidedly uncivil, based on exclusion and control. Wark noted that the rise of civil society necessitated at its earliest stages new forms of media through the personal essay – each of which have had to be regulated in turn by the state. In our current moment, Wark suggested, our media sphere is dominated by, admittedly noisy, admittedly chaotic, private interests, who are not working towards a public good. In that sense, whether there was interference in our elections from Russian oligarchs matters little, as we’re equally in thrall of our American oligarchs. To fight this, Wark argued that we need a range of actions, from sanctions, to direct protest, to the legal challenges we’d heard of earlier, to education. Burak Arikan, a Turkish artist currently serving as a Fellow at SFMOMA’s Public Knowledge Initiative, then offered some of the work that artists and technologists are working on to educate the population. In particular, Arikan is seeking to address data asymmetries, making visible the power relationships between private actors, corporations and government. His tool, Graph Commons, is a collaborative mapping program that enables investigative journalists, archivists, and interested citizens to visualize the connections in their politics. Civic Data Solidarity is a program he’s currently working on to ensure that the public data sets available communicate with each other and promote greater transparency. Erica Baker, CSO at Patreon, concluded the session with a discussion on how technologies have been used by civil society with both positive (such as overthrowing corrupt governments) and negative (such as harassing members of a community to fight against diversity) results. Baker argued that most technology companies do not particularly care if their tools are used for evil, ultimately minding most their bottom line, which is built on ad revenue: on clicks and stickiness. Sock puppets and bot armies are therefore allowed to proliferate – and indeed, when technology companies learned of their existence before the 2016 election, were largely ignored. Erica concluded with a call to leave an ad centered internet and a push for education that will allow us to build mental firewalls. In the panel, moderated by Deena Chalabi, assistant curator at SFMOMA, the speakers suggested that as a society we needed to spend more money, time, and effort on time based media such as education and the state, to correct our course. They also argued for building new infrastructures to replace our current, broken model. Artist Hank Willis Thomas, co-founder of the first artist-led superpac, For Freedoms, closed the day with a call for direct, visible, involvement. Tracing how old debates have been recycled, Thomas proposed that although we might believe in our authorship and have a sense of ownership over our ideas, we are all most often human retweets. Which is not necessarily a bad thing: in fact, harnessed, it can be far greater than any bot army or monied campaign for our social currency has value. For Freedoms leverages this understanding, using the commercial system to bring about political discourse. Asking organizations and institutions from across the country to band together to create conferences, town halls, exhibitions, performances, interventions of all kinds – on the subject of freedom, For Freedoms has helped shape the political conversation on a local level that has had national implications. Indeed, their 50 States Initiative, which had artists create billboards on freedom over all fifty states has had an incredible response from local and national press.